Anyways – look! Acorns! Or lookalike weaving! 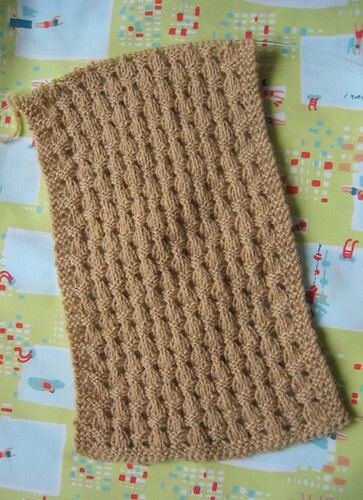 And obviously at the end of a long winter, just as it starts to heat up, it makes total sense to start knitting a scarf! No? Well I have 5 balls of this yarn and I want to make a long, fine, thin scarf, because the yarn is pretty delicate and this way it won’t get worn-away. I can just bundle myself up in it’s softness and feel hugged. Or something. And maybe cuff warmers too, if there is enough wool left. Actually knitting winter stuff in the spring/summer makes a sort of sense to me. It means i can pick up and put down the projects as and when i want to, and have something to look forward to wearing when the weather gets cold. Still no news about the job – which means i didn’t get it – or the yarn, which i’m hoping will arrive tomorrow. Darn it. I’ll keep my fingers crossed you did get the job and they are just bad communicators! AND love that knitting.. pretty.